To estimate the amount of each resource you need, examine the nature of the task and the capacity of the resource. Ensuring that nonpersonnel resources are available when needed requires that you specify the times that you plan to use them. You can display this information in separate usage charts for each resource. 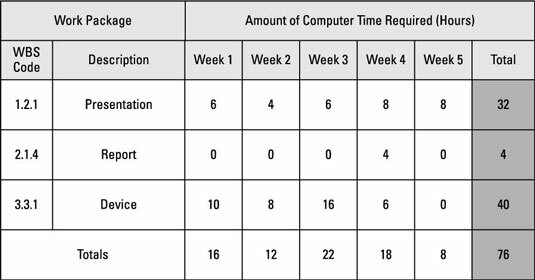 This computer usage chart depicts the amount of computer time each task requires during each week of your project. For example, the chart indicates that Task 1.2.1 requires six hours of computer time in week 1, four hours in week 2, six hours in week 3, and eight hours in each of weeks 4 and 5. You’d prepare similar charts for required copier time and use of the test lab. Finally, you display the total amount of each nonpersonnel resource you require during each week of your project in a nonpersonnel summary usage chart. The information in this chart is taken from the weekly totals in the individual usage charts for each nonpersonnel resource.